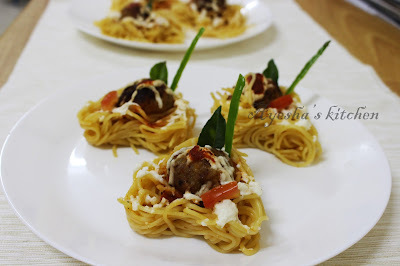 Spaghetti with meatballs is an Italian dish consists of spaghetti/pasta, meatballs and tomato sauce. Italian spaghetti is made from wheat semolina, but can also be made with other kinds of flour. Pasta with meatballs is a traditional recipe of Italy, made to their tasty standards. BUT here I made some changes to suit Kerala / Indian taste. So the meatballs I here made with the same ingredients which we used for chicken samosa or cutlet fillings and it tastes gorgeous. 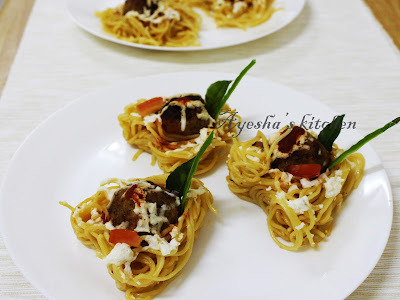 Actually, this recipe came to my mind only because of my craziness towards pasta and noodles....though this is my first attempt, it turns out well and I do love to try out new varieties of pasta and spaghetti. Spicy Tomato sauce - as required ( either you can buy from the store or homemade sauce recipe is given below). Mix in minced chicken, finely chopped onion, green chili, ginger garlic paste, fennel seed powder, garam masala powder, salt in a bowl well with bread pieces and make a smooth dough. Make small lemon sized ball and fry in hot oil. ( do not deep fry). Keep it aside. Heat 2 cups of water in a pan and once boiled add salt and 2 tbsp oil to it. Then add the Spaghetti ( do not break it) and stir continuously. Cook for 5 minutes or until the water gets dried up. 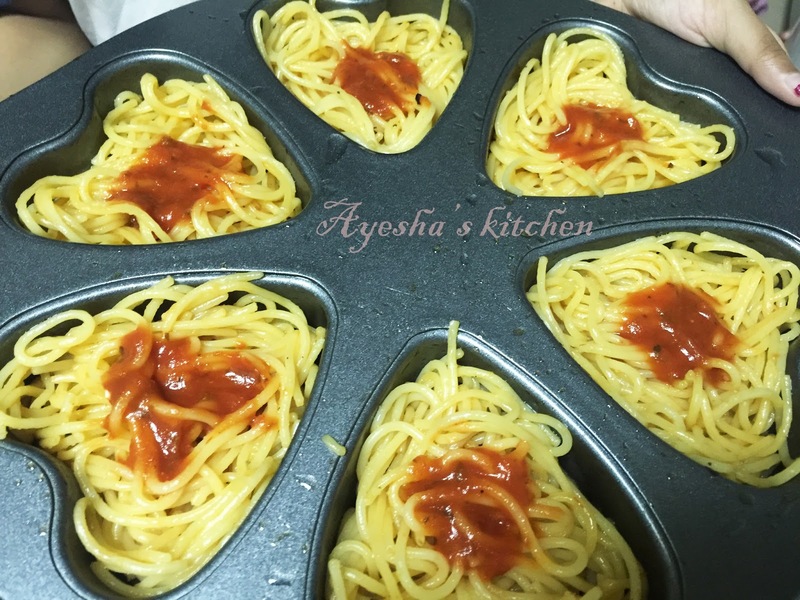 Then remove it to a plate and spread some oil in the same pan and add the cooked spaghetti to it along with 2 tbsp tomato sauce. Mix well and add salt if required. Stir continuously for few minutes in low flame. Now take a mold as shown in the image and grease it with ghee or butter. Layer the spaghetti first and slightly press it and shape it. Then drop some sauce over it and keep the meatballs . 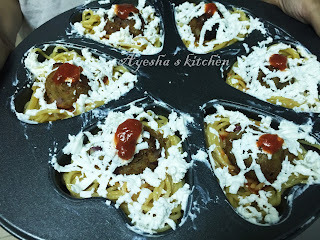 Finally, top it with grated cheese. Either you can bake in the oven for 5 - 8 minutes or until cheese melts. ( if on stove top, keep the mold inside a nonstick pan with hot water and steam it for 15 minutes). When the cheese melts take out of the vessel and let it cool. Then take out of the mold and garnish with tomato sauce and chopped tomato. Remove the skin of tomatoes and puree it. Now heat a pan and saute garlic and onion over medium flame. Then add all other spices (except pepper and cilantro) one by one and cook until the raw smell disappears from the masala. Stir in the pureed tomato and mix well. Cook in low flame for 1 hour until thick with the uncovered pan. Now finally add pepper and cilantro to this and mix well. Once cooled either you can grind it or else can be used same as it is..( leftover sauce can be stored in the freezer for 3 months).